Hiking/walking - The 4,500+ acre Currituck National Wildlife Refuge has six separate "units" of wild terrain which are located in between Corolla and the VA State Line, and which are home to very rugged and unestablished paths that veer from the dune line to the soundside marshes. For a gentler hike, head south to the Currituck Banks National Estuarine Preserve, which features a primitive path to the Currituck Soundfront. There's also a handicapped accessible and elevated boardwalk that winds through the maritime forest and leads to a fantastic sound view. Biking - Experienced bikers can ride the sandy and dirty path through the Currituck Banks National Estuarine Preserve, (located just north of Corolla), to enjoy a Currituck Sound view. In addition, some adventurous bikers utilize the hard-packed, sand vehicular tracks that run parallel to the shoreline to explore the Carova coastline. If going this route, use caution and be on the lookout for 4WD trucks using the same sand "road." Otherwise, bikers who don't want to tackle the sand should head to the town borders of neighboring Corolla to explore the town via the paved bike lanes and sidewalks that run alongside NC Highway 12. Kayaking - Many soundside communities feature canalfront docks that provide easy paddling access to the Currituck Sound. There's also a public boat ramp at 2100 Ocean Pearl Road, (or milepost 21), at the newly established Carova Beach Park. Adventurous explorers can also haul their kayak to the sound via the rugged trails in the Currituck Banks National Estuarine Preserve and the Currituck National Wildlife Refuge. For rentals and equipment, head south to Corolla where watersports tours and guide companies, like Coastal Explorations and Kitty Hawk Kites, can be found. Birding - The Currituck National Wildlife Refuge is fantastic for bird watchers, as the wooded and marshy regions are home to thousands of migrating birds during the fall, winter, and spring months. The elevated boardwalk within the Currituck Banks National Estuarine Preserve, (located close to the 4WD ramp at the end of NC Highway 12), is also a good, handicapped accessible destination for spotting wooded songbirds. Surfing - Surfing is allowed throughout the Carova beaches, and surfers can simply cruise the beach via a 4WD vehicle to find the best shore breaks. Waves are at their best when a hurricane passes well offshore, or right after a fall or summer storm. Equipment, rentals and lessons can also be acquired in neighboring Corolla at local surf shops, like Island Revolutions and Corolla Surf Shop. Lighthouses - The closest lighthouse to Carova is the Currituck Beach Lighthouse, which is adjacent to the Whalehead in Historic Corolla in Corolla. The 158' ft. tall lighthouse was built in 1875, and is seasonally open for climbers for a small fee. There's also an adjacent gift shop and small museum, as well as a large soundside park - the Historic Corolla Park - which is often the venue of choice for local art shows, seasonal live music, and annual events. Fishing - Fishing is allowed throughout the Carova beaches, from the Atlantic Ocean to the Currituck Sound. A NC Saltwater fishing license is required to cast from the oceanside shoreline, and a freshwater license may be required to fish in the barely-salty Currituck Sound. Fishing licenses and can be picked up at local tackle stores in Corolla, such as TW's Bait & Tackle, and information on fees and license requirements can be obtained via the North Carolina Wildlife Resources Commission (NCWRC's) website at http://www.ncwildlife.org. Beaches - There are about 11 miles of beaches along the Carova shoreline which are wide open for visitors. Beach goers are advised to set up their chairs, towels and umbrellas well below the high tide line, in order to be far from the 4WD vehicular traffic that flows along the beach. (Conversely, 4WD drivers are advised to stick to the established "tracks" that are found close to the dune line when driving along the beach, and not attempt to drive along the ocean wash.) There are no lifeguard stations in Carova, however seasonally lifeguarded beaches can be found in adjacent Corolla. Wildlife viewing - Visitors who want to spot the famous Corolla Wild Horses can book a 4WD tour from local vendors such as Corolla Wild Horse Tours, Bob's Corolla Wild Horse Tours, Outer Banks Wild Horse Tours, or Corolla Outback Adventures. 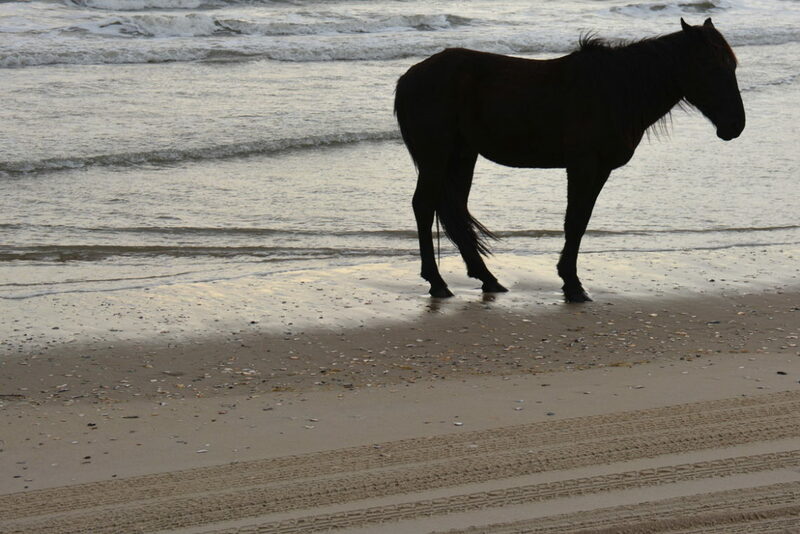 With that being said, vacationers who are staying in Carova may be able to spot the horses roaming along the dune line, close to a relatively deserted stretch of beach, or grazing in the backyards of soundside communities. For more broad wildlife viewing, (which includes birds, foxes, and even deer), head to the elevated boardwalk at the northern edge of the Currituck Banks National Estuarine Preserve. Wildlife viewing is at its best in the off-season months, when the beaches are relatively isolated. Swimming - Many of the larger vacation homes in Carova, (roughly 5-6 bedrooms or more), have private swimming pools that can be enjoyed by guests from around late April or May through early October. The ocean is also warm enough for swimming from late May or early June until early or mid-September, although "cold swells" or cold currents can sometimes lead to ice-cold ocean swimming conditions, even during the height of summer. Most of the shoreline has a gradual slope, which produces smaller waves, and makes it easy to wade out into the water. Camping - Camping is not allowed anywhere along the soundside or oceanside Carova shoreline, and there are no local campgrounds in Carova, or the neighboring Outer Banks towns of Corolla, Duck and Southern Shores. There are several campgrounds on the Currituck Mainland, such as Bells Island Campground in Currituck, Camping Resort in Coinjock, and Sandy Point Resort Campground on Knotts Island, which have boat ramps for visitors who want to take a self-guided exploration of the Currituck Sound and western Carova shoreline. Stand Up Paddleboarding - Visitors can enjoy stand up paddle boarding via a private vacation rental home's canalfront or waterfront dock, or can launch via the all-purpose Carova Beach Park at milepost 21. The ocean waves are also typically gentle enough for stand up paddle boarders, and neighboring Corolla's Historic Corolla Park has an exceptional small boat launch that leads directly to the Currituck Sound as well. For rentals and lessons, head to local watersports shops in Corolla, like Island Revolutions or Kitty Hawk Kites. Golf - The closest Golf Courses to Carova are the Duck Woods County Club in Southern Shores and the Sea Scape Golf Links in Kitty Hawk. Both of these courses are located about a 20-30 minute drive away. There are also a number of renowned golf courses on the Currituck Mainland, (roughly an hour drive away), including the Point Golf Club, The Carolina Club, Kilmarlic Golf Club, and the Holly Ridge Golf Course. Scenic spots - Head to Wash Woods Beach, a stretch of shoreline that is unmistakably distinctive for its collection of weathered and ancient tree trunks protruding out of the sand. The maritime forest along the borders of the Currituck National Wildlife Refuge is also remarkable for the innumerable clusters of twisting live oaks and cedar trees. For a fantastic Currituck Sound sunset, pay a visit to the Carova Beach Park, the boardwalk at the borders of the Currituck Banks National Estuarine Preserve, or the waterfront Historic Corolla Park in neighboring Corolla. Boating - A public boat launch that accesses the Currituck Sound is located at the Carova Beach Park at Milepost 21, on 2100 Ocean Pearl Road. There's also a public boat launch a few miles south of Carova at the Currituck Heritage Club, (next to the Whalehead in Historic Corolla), in Corolla. In addition, many soundside vacation rentals in the Carova area have canalfront docks which can accommodate small vessels, and which directly connect with the Currituck Sound. Educational - The elevated boardwalk at the Currituck Banks National Estuarine Preserve has a number of informational plaques indicating local species of interest, effectively providing a semi-self-guided tour. Visitors can also head south, to the Outer Banks Center for Wildlife Education in Corolla, for a massive introduction to the wildlife and ecosystem of the Currituck Banks. Museums - The region's deep history is perfectly chronicled at the Whalehead in Historic Corolla in Corolla, a 1920's art-deco masterpiece that was once a wealthy hunt club. The adjacent 1875 Currituck Beach Lighthouse is also worth a trip, and is flanked by a small museum which is housed within the original lighthouse keepers' quarters. Corolla is also home to the Wild Horse Museum, which highlights the history of the Corolla Wild Horses, and also provides information on current preservation efforts. Shelling - Carova is arguably the best region along the northern Outer Banks or Currituck Banks for shelling, thanks to its isolation, and gradually sloping shoreline. While the occasional large find, like a lightning or knobbed whelk, may wash up after a summer storm or even after a low tide, beachcombers will want to keep an eye out for smaller shells. Periwinkles, olive shells, augers, and coquinas wash up on a regular basis in the summertime, and are beautiful but delicate finds. Search along the shoreline, right along the water's edge, for the best chances of finding small piles of perfectly intact shells. Windsurfing and Kiteboarding - Windsurfing and kiteboarding are popular both along the gentle oceanfront and in the Currituck Sound. Boarders can pick up equipment rentals and lessons at local watersports companies, like Kitty Hawk Kites in Corolla, and can launch via the Carova Beach Park or the Historic Corolla Park in Corolla. The fall and spring months are best for these wind-driven sports, as the local Outer Banks winds tend to be a consistent 10-20 mph during these seasons. Nightlife - For karaoke, live music, and DJs, visitors will have to head south to Corolla, where a nice handful of restaurants and bars can be found. Sundogs Raw Bar & Grill, Flip Flops Bistro and Bar, and The Blue Point Grill are all popular seasonal night spots for vacationers. While there are no restaurants, bars, or pubs in Carova, visitors can nevertheless enjoy the "nightlife" of the region by ghost crab hunting and star gazing along the shoreline. Visitors should also keep in mind that many of the higher end vacation rentals in Carova have their own entertainment on site, including vast game rooms, theaters, private pools, and more. Crabbing - The best place to crab in Carova is via a canalfront dock, and many soundside vacation rentals offer a private dock for their guests' use. Simply drop a baited crab pot for a day or two, (which can be acquired at Corolla tackle stores), or try a little hand-lining, for the best results. Visitors can also take a boat or kayak out to the Currituck Sound via the public boat launch at Carova Beach Park at Milepost 21. The open waters of the Currituck Sound are renowned for exceptional crabbing, clamming, and fishing, and are a popular destination for anglers of all interests.